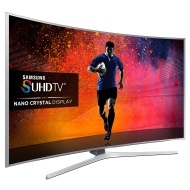 alaTest has collected and analyzed 269 reviews of Samsung UE55JS9000 Series. The average rating for this product is 4.5/5, compared to an average rating of 4.3/5 for other products in the same category for all reviews. Reviewers really like the durability and design. The color and usability also get good feedback. Views about the price and sound are different, while the tuner and reliability get critical opinions. We analyzed user and expert ratings, product age and more factors. Compared to other products in the same category the Samsung UE55JS9000 Series is awarded an overall alaScore™ of 92/100 = Excellent quality. alaTest has collected and analyzed 21 user reviews of Samsung UE55JS9000 Series from Amazon.co.uk. The average user rating for this product is 4.7/5, compared to an average user rating of 4.3/5 for other products in the same category on Amazon.co.uk. Reviews about the size and design are generally positive. The usability and image quality are also appreciated. The reliability and durability get critical views, while comments are divided on the sound. It makes a far bigger difference to the way movies and TV shows look and, now that consoles like the Xbox One X and the Sony PS4 Pro are getting in on the act, your games will look better than ever as well. A preview of the new 55-inch high-end curved Ultra HD 4K LED LCD TV from Samsung for 2015. TV picture is awesome! Enjoying the easy to use features as well. I was a little worried about getting the Curved TV, but once I had it in my house, it looks even more amazing. The features are great and the ability to upgrade the "one connect" is definitely worth it. Outstanding tv. I love it. Great features. The picture is amazing. It is definitely worth the price and more. If you think your TV is good... Upgrade to great! This TV is incredible, you must see why you've been missing!